SEATTLE, WA, U.S. – La Marzocco, world leader in espresso machine innovation since 1927, will be showcasing their best in commercial design inside Specialty Coffee Expo, taking place April 11-14, 2019 in Boston, MA. Their newly launched KB90, Linea PB and Leva, all commercial machines, will be front and center inside the La Marzocco booth for attendees to experience and learn more about. Modbar AV and the newly released Modbar Steam will power this year’s True Artisan Café, planned with world class rotating roasters and other partners on bar. Both Kent Bakke, Board Chairman, La Marzocco International, and Guido Bernardinelli, La Marzocco International CEO, will be in attendance. The KB90, launched in February 2019, will be making it’s SCA debut. This revolutionary machine named after the former La Marzocco International CEO and now Chairman of the Board, Kent Bakke, is designed for the barista, providing a faster work-flow, easier cleaning and advanced ergonomics. KB90, designed to represent the curves in the shield of the La Marzocco Lion, is the ultimate evolution of the Linea PB. “It’s always been a part of La Marzocco’s DNA to focus on the job of the barista. Twenty years ago, we started thinking that espresso machines should be operated with natural movements and motions to increase the enjoyment and speed of use for the barista. With the creation of the KB90’s Straight-in Portafilter, I feel that we have built a machine that will forever improve the way the barista interacts with our machines,” shares Kent Bakke, Board Chairman, La Marzocco International. La Marzocco will also have the Linea PB and Leva in booth for demonstrations being led by the company’s global sales and marketing teams. Leva re-invents the lever espresso machine of the 1950s and 60s for today, offering a groundbreaking aesthetic and engineering in a solid, mechanical yet safe, reliable and user friendly machine. The Leva has an innovative user-interface and eye-catching design. True Artisan Café, an annual stand out feature of La Marzocco’s SCA presentation, will be completely powered by Modbar Espresso AV and the newly released Modbar Steam. Modbar Steam launched in January 2019 and is a stand-alone steaming system designed for retail environments that require powerful steam capacity in a modern minimal aesthetic. Following the release of Espresso AV in April, 2018, this new Steam system completes the full undercounter AV espresso setup. This new system is ideal for cafes that are looking for a companion for Modbar Espresso AV; augment steam capacity in an existing bar layout; or build an independent beverage-heating work station on bar to improve work flow. Three stations will run on rotation with world-class roasters and specialty coffee partners. La Marzocco will be featuring 42 different roasters at this year’s expo. 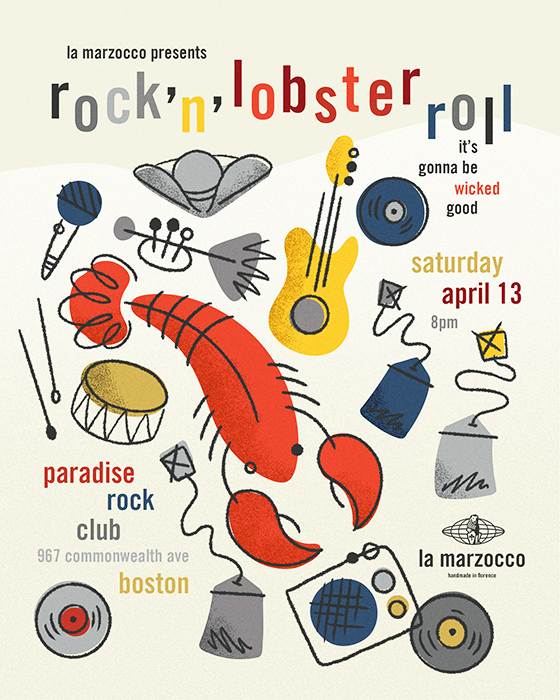 On Saturday April 13, La Marzocco will host “Rock‘n’Lobster Roll”, a special event taking place at legendary Paradise Rock Club in Boston. This party will be first come first serve for all SCA attendees with capacity of 950. The company has quite a few surprises planned for this special night of celebration. For more information on this special event https://www.facebook.com/events/276729036571065/.